Advanced Environmental Services offers concrete polishing services to clients throughout the St. Louis area. Concrete polishing can transform old or new concrete floors in to smooth, durable, and attractive surfaces. Polished concrete flooring is extremely low maintenance and perfect for a variety of applications including in commercial buildings, industrial plants, and warehouses. If you are interested in our concrete polishing services for your building, please feel free to contact the flooring experts at Advanced Environmental Services or learn more about the benefits of and uses for our Concrete Grinding and Polishing Services. Polished concrete is a high gloss flooring finish that is attained by using special diamond concrete grinding equipment. This concrete grinding equipment uses diamond impregnated abrasive disks, which are similar to sandpaper, to grind down concrete surfaces to the desired degree of shine and smoothness. Polished concrete has a very shiny, high gloss surface that is low maintenance and attractive. 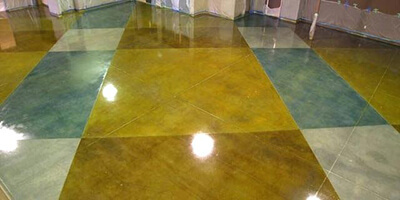 Polished concrete can also be stained or colored using special stain to create a variety of patterns and colors. At Advanced Environmental Services, we offer concrete stain application services using a variety of types of stain. Our concrete polishing and staining services can be an affordable alternative to replicate the look of polished stone or other expensive flooring surfaces such as marble or granite. At Advanced Environmental Services, we offer our concrete polishing services to all types of clients especially commercial and industrial clients. If you are interested in our concrete polishing services for your building, manufacturing plant, or warehouse, please feel free to contact us at Advanced Environmental Services in St. Louis. You can also learn more about concrete polishing here on our website. Yes, nearly all types of concrete flooring can be polished. At Advanced Environmental Services, we offer these concrete polishing services for almost all types of concrete floors. Our concrete polishing services are available for both new and old concrete floors as long as the floor is determined to be structurally sound. Generally, new concrete floors must cure and harden for a certain number of days prior to polishing. Additionally, old and existing concrete may need to be cleaned using concrete grinding or shot blasting prior to concrete polishing. Although concrete polishing turns regular concrete surfaces into smooth, high gloss floors, it does not typically result in the creation of an overly slippery surface. In general, clean, dry polished concrete surfaces are no more slippery than plain concrete surfaces, and they are often less slippery than waxed linoleum or polished marble floors. How do I Maintain Polished Concrete Floors? Our concrete polishing services result in the development of a very durable and low maintenance flooring surface. This flooring will not trap dirt, dust, or mold and can easily be wiped clean with a damp mop to remove any dust or grit that may have accumulated on the surface. Typically, polished concrete is hard wearing and will maintain its shine for years.